Scientific Background: Isotype matched controls are useful in flow cytometry to determine a gross estimate of non-specific binding that may be observed with a specific antibody of interest. In general, an isotype control should be of the same species and isotype as the antibody of interest, used at the same concentration, and conjugated to the same fluorophore. This reagent is an IgG1 isotype mouse monoclonal antibody (Clone # MOPC-21), conjugated to FITC. 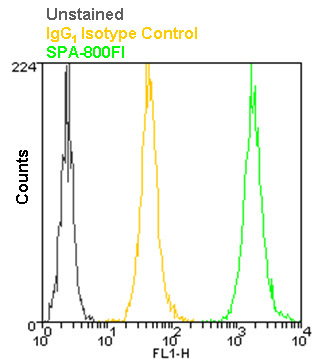 It is intended for use as an isotype control antibody for flow cytometry. Flow cytometry analysis of 106 Jurkat cells using the Isotype Control for IgG1 FITC (Prod. No. ADI-SAB-600FI) compared with Hsp27, mAb (Prod. No. ADI-SPA-800FI), at a concentration of 50µg/ml.